The sun shines on the Flowery Meadow. The ants are preparing for their daily food gathering as usual. But this day is different! A few bugs turned against these peaceful creatures! Now they have to fight for their home! Immerse yourself into the wonderful microcosm of vivid meadows, barren deserts and mysterious forests! Send your ants and bees out and gather food! Protect your hive against intruders with your army of various beetles! But who are these intruders? Who is your enemy? What is this battle for? Find out that mystery and help your creatures to win their epic battle for freedom and peace through 39 missions! 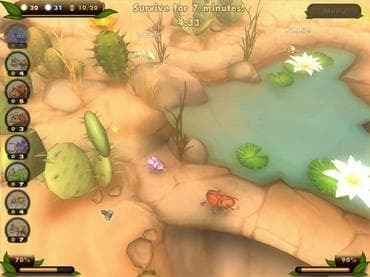 BugBits is an Action and Strategy game with unique gameplay which is continuously changing and improving as new kind of bugs are getting unlocked. The simpleness of the first levels later turns into a complex tactical warfare with unlimited possibilities. Each of the 20 playable bugs have different strengths and weaknesses. Combine them together to build effective strike forces! You can also play with your friend or family member in the two-player mode of Bug Bits or beat the challenge records for endless fun! Download free full version game today and protect your hive! If you have questions about Bug Bits game, please contact us using this form.